Pimple truly becomes the most frustrating skin problem for every woman. It normally develops to teenagers during the puberty time. Pimple frequently appears on the face, behind the ears, neck, or instead in the shoulder areas. To get this little thing rid of that area, some people are willing spending their money only for the treatment. 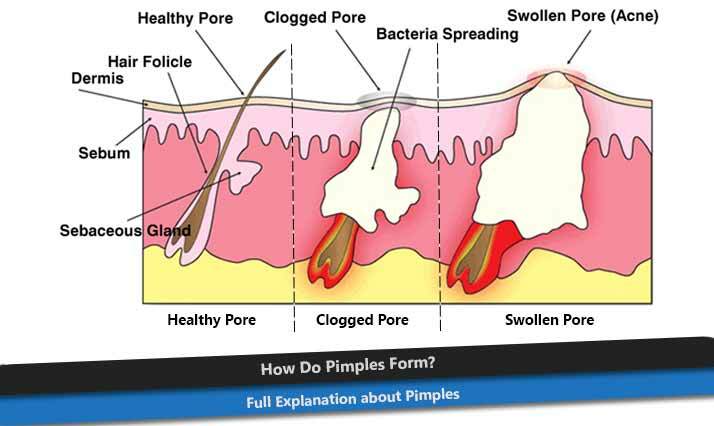 Talking about pimples, some of us sometimes do not exactly know how pimples form. Actually, there is a lot causes why pimple form in our face or body. Food, cleanliness, genes, and other things can be the causes why pimple appears on your face or body. In the first, you should know about what pimple is. It is a condition where there is a bump on your skin. It is also popular as zits, spots, or acne. This skin condition commonly shows up in some areas like the face, back, neck, or shoulder. Pimple actually becomes one normal skin problem for teenagers, especially girls. This normally appears due to hormonal changes during their puberty or period. For some people, those pimples during will go away when it’s no longer their period or puberty time. Actually depends on several conditions. It can show up on our face or body due to some factors. It comes up because of skin inflammations. Basically, pimples commonly formed by the time the cells of your dead skin have too much oil (sebum). The skin pores then become clogged and infected, causing bumps or swelling. Your skin pores have a sebaceous gland that produces sebum or oil skin continuously. Too much sebum can be a problem when it is mixed together with dead skin cells which causing clogged pores. These clogged pores push the unwanted bacteria to grow just like Propionibacterium acnes. During puberty, the sebaceous glands will produce more sebum. This is why teens often have problems at that time. However, pimple on your skin is not only comes from the excess oil. You can also have pimples because of foods or genes. Pimples actually have several kinds of types. Each type has its own signs and symptoms. Mainly, pimple is divided into 6 types: whiteheads, papules, cysts, pustules, blackheads, and nodules. Some of them is filled with pus and pain. However, whatever the types of pimples you have, it can go away from your skin with these steps. The hygiene of your skin is truly important. You need to wash your face at least two times a day with a cleanser. Cleaning your face regularly can remove excess oil and dirt on your skin. This can stop the pimples to grow or prevent your skin from it. After cleaning your face, it will be so much better to apply non-comedogenic to prevent your skin dry or irritated. Besides going for medical treatment, you can do several home remedies to get rid your pimple. You can do some natural ingredients like tea tree oil, honey, lemon, and others and make it into scrub or mask. Your foods also will have an effect to your body. Avoiding consuming too much junk food, soda, and sweet snacks can be good to prevent pimples. Try to consume healthy food like veggies, fruits and vitamins.